The artists’ collective Foreign Investment (FI) recently completed a new work in Oslo in their series of ‘GOLD EXCHANGE’(Oct. 2010); unique, site-specific and culturally specific versions of this work around ‘Gold’ have previously been shown in London, Istanbul, and Rio de Janeiro. 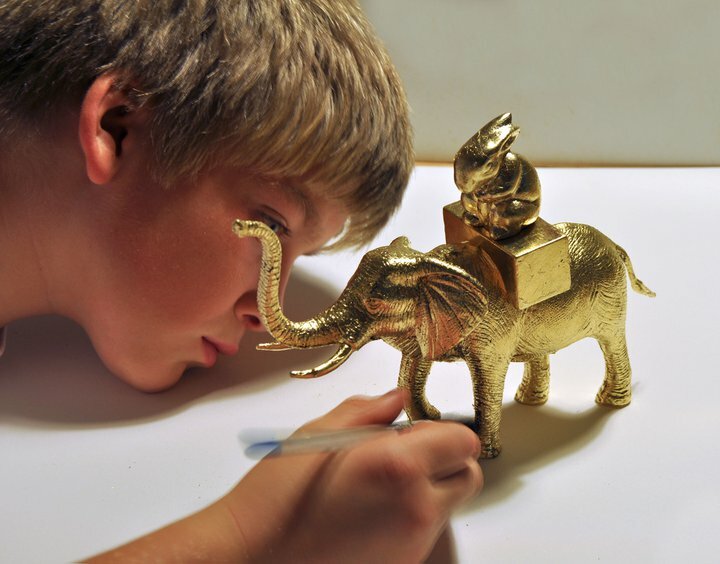 This time OSLO GOLD-EXCHANGE used ‘child labour’ to transform unloved and discarded toys into golden objects of desire. In the first part of the work, children in Groruddalen from Rødtvedt Skole and Skogkanten Kindergarden as well as the local library at Romsås were invited to bring their redundant toys and work with FI over four days on a crash course in magical transformation using gold gilding techniques. Through a process of patience and application the children were exposed to and experienced the framework and philosophy of FI; about divisions of labour, a tedious process of manual labour and values of shared authorship and teamwork. Having participated in gilding the toys, each child received a ‘golden hand shake’ from the artists and a certificate to attest that each objet trouvé once again is a desirable object. After the series of workshops, all the golden toys (signed and numbered) were displayed at Galleri Format where they again were re-distributed through an art tombola performance to raise funds for a local charity. This social-art event is a not-for-profit project that aimed to give discarded toys/ objects another lease of life through up-cycling, whilst creating awareness of notions of value. With their efforts and play the children assisted in raising funds for other children in need in their own town. This re-investment in the local community by the local community using art as a vehicle could become a blueprint for other social responsibility initiatives – albeit the focus primarily is about inspiring and seeding community spirit. OLSO GOLD-EXCHANGE was commissioned and produced in collaboration with Mesen Kulturprodusenter , and Foreign Investment. The project was Funded by Arts Council Norway and Oslo Kommune.